Artist Roman Booteen specialises in engraving American coins and zippo lighters with unusual designs; often reimaginations of artwork or stories from other famous creatives. The coin above depicts the discovery of the Holy Grail and has the unusual features of a removable piece of the coin as well as the activated window. Below you can see footage of the engraving work. The lettering OUOSVAVV is famously believed to be a code used to indicate the location of the grail. These letters appear on the Shepherd’s Monument at Shugborough Hall on Cannock Chase – not too far from our location in Birmingham – though their true meaning is still contested. Monument experts have dismissed the marks as graffiti, while an American NSA linguist believes it stands for ‘Oro Ut Omnes Sequantur Viam Ad Veram Vitam ’ - I pray that all may follow the Way to True Life. This isn’t the first time that Booteen has attracted a lot of attention for his work. 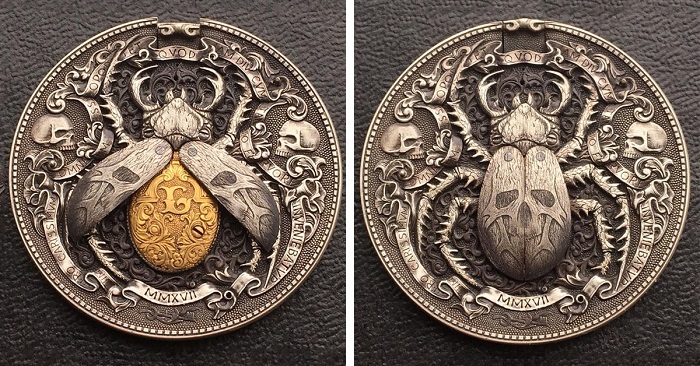 His adaptations sell for thousands on the auction website eBay, with coins based on art such as Albrecht Durer’s 1513 “Knight, Death and The Devil” and a "Witch and Satyrs" coin currently being auctioned for over $1,500. His ‘Gold Bug’ – inspired by The Gold Bug by Edgar Allan Poe – sold for $9.2k late last November. To date his biggest sale was last August with the Biting Coin – a Morgan silver dollar with a golden trap made up of a gold 2-Peso coin. The coin has teeth which bite those who spring the trap in trying to reach the gold centre. You can find Roman Booteen via his Instagram page. Unfortunately he does not do commission work, but if you’re lucky enough to have a few thousand dollars of spending money to hand perhaps you could own a unique mix of history meets art.